Why LED Furniture? You’re furnishing the restaurant, the bar, or the house. Maybe you’re looking for something elegant and sophisticated but different. You know, not the same old drab decor. Maybe what you’re searching for is LED Furniture. LED Furniture is not only a sleek and elegant furnishing highlight, it allows you to set the mood in the room the exact way you want. LED lights accent the area with room lights on or off, creating a unique and different atmosphere. That’s all most people care about: the way it sets off the venue. But that’s not the only advantage to LED lighting. LED lighting lasts almost forever. Average bulb life estimates are much higher than florescent or incandescent bulbs, running up to 50,000 hours or more. LED lights can emit any color and do it more efficiently, without much heat. So operating costs are low and the LED lights also light very quickly, in under a microsecond. And if you’ve seen LED lighting, you know it’s beautiful. LED Furniture adds a unique style and look to any venue. From restaurant to bar to your living room, this makes your area one of a kind. Many commercial enterprises have taken this opportunity to make their establishment not only look great, but to stand out from the crowd. 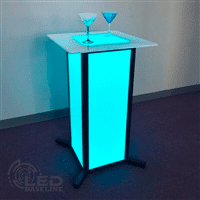 LED Baseline builds elegant tables of any style or type to fit your need, with quality and fitting unmatched, from coffee tables to side or wall tables and bar counters. Not only that, your furniture is designed to your specifications, so it really is one of a kind. If you haven’t checked out our beautiful custom tables before, now is the perfect time to do so. They are stunning. LED Baseline can also build gorgeous display shelves to show off your bar or any other display. 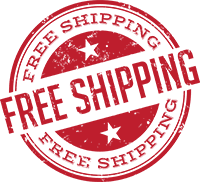 And shipping is usually free. Contact us today for more information.